Coventry City have until 2 April to confirm where they will play next season. Coventry City's owners Sisu Capital Ltd have rejected an "extremely low" takeover bid from a consortium led by former vice-chairman Gary Hoffman. The League One club, which has been owned by Sisu since 2007, are yet to confirm where they will play their home games next season. A statement from the consortium said an offer of more than £7m was rejected on Monday "without any discussion". However, Sisu responded that the bid had "little credibility". The Sky Blues are seventh in the table, a point off the play-offs, and Sisu described the consortium's bid as "an effort to undermine and distract from the club's on-pitch performance". "For the avoidance of doubt, yet again this was an extremely low bid," the investment management company added in a statement. "It has little credibility and as usual provides no proof of funds nor confirmation of the investors/consortium members (as had been included in the past)." The consortium told the Coventry Telegraph their bid was "a higher cash offer up front than the £7m turned down last time" and that a request to meet with Sisu chief executive Joy Seppala had been rejected. They also urged Sisu to undertake "constructive dialogue" over the club's future. 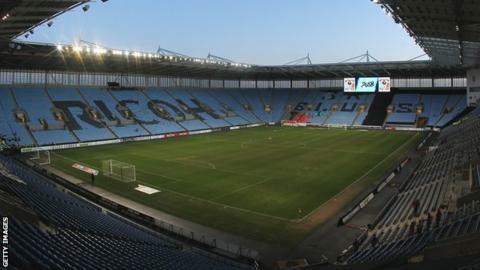 The Sky Blues' current rent deal at the Ricoh Arena with Premiership rugby club Wasps expires in the summer, and the English Football League has set a deadline of 2 April for Coventry to confirm where they will play next season. City's owners remain in a legal dispute with Wasps, the owners of the Ricoh, and Coventry City Council. If it is not resolved by 2 April, EFL clubs will be notified about a meeting to decide Coventry's future. The EFL's Extraordinary General Meeting would take place on 25 April, at which Coventry could face expulsion from the league. Sisu, meanwhile, has said it will drop a long-running legal case against the council in return for their help to relocate to a purpose-built new home and also wants Wasps to allow City to remain there until a new stadium is built. A delegation from The Sky Blue Trust and other concerned Coventry fans are due to head to the EFL's and Sisu's London offices on Thursday to highlight the issues.